You are here: Home / News / News / Introducing our Employee of the Quarter and Team Competition Winners! We celebrated the end of a very successful quarter last Friday with the team. We announced the results of our Employee of the Quarter and the winners of our other internal competitions we host every quarter for our team. We are pleased to announce that the first Employee of the Quarter for 2019 is our Permanent Division’s Consultant – Sarah Palmer. Sarah has impressed us with her dedication to Pursuit, as well as her overall performance and professional growth following training sessions with our Managing Director, Lorraine Phair, and Samantha Chambers, the Permanent Division Manager. Sarah joined Pursuit in the summer of 2018. She brought with her over 5 years of recruitment experience as a senior resourcer and was ready to take the next step in her career as a consultant. Lorraine saw a lot of potential in Sarah when she interviewed, and the rest – as they say – is history! She passed her probation earlier this year and we look forward to seeing her grow further in her career and continue to exceed expectations! Recruitment is a target driven industry and therefore we like to have a little fun with our consultants by running quarterly competitions to win vouchers of their choice. 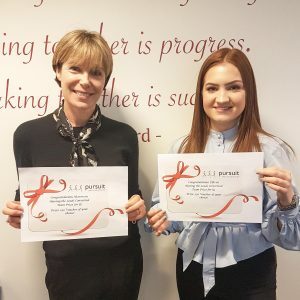 This quarter’s winners are our Business Development Manager – Sharon and our Trainee Recruitment Consultant Elle. Looking back at last months Employment Law Seminar Bringing you the latest news this Easter!